Of all the adjectives one might expect to see used as a descriptor of a series within Hanna-Barbera’s long-running Scooby-Doo franchise, “epic” is probably pretty far down the list, hovering somewhere in the same vicinity as “hip” and “hilarious,” yet there would be nothing inappropriate about using any of these three words to describe the most recent incarnation of the Scooby gang, Scooby-Doo! Mystery Incorporated. Keen-eyed readers may recall that only one lonely soul amongst the TV Club list of contributors cited it on their ballot for Best TV Series of 2012—okay, fine, it was me—but as the second half of the series’ second season has unspooled, the number of pop culture references have been so incredibly geeky that one can only hope that word of mouth will bring that number of votes up to at least two or three when the time comes to submit 2013’s ballots. When Scooby-Doo! Mystery Incorporated kicked off in April 2010, it was clear from the get-go that it was a series which aimed to do the seemingly-impossible: make Scooby-Doo cool again. Although perpetually paying homage to the original series whenever possible, the show immediately introduced several elements which set it apart from its predecessors. The Fred and Daphne romance was finally formalized (albeit with the caveat that, for all of Daphne’s feelings for him, Fred’s one true love was trap-making), as was one between Velma and Shaggy, although Shaggy’s perpetual concern was that Scooby might get jealous. The gang was provided with a permanent home base—Crystal Cove, a town proud to call itself “The Most Hauntedest Place on Earth” and pissed that these meddling kids keep proving their promotional claim false—and all of their parents were introduced to the mythos, and the witty repartee between this Scooby gang began to resemble the back-and-forth stylings of those pretenders to the name on Buffy the Vampire Slayer, including a tendency to drop unexpectedly hip pop culture references. The biggest change, however, was the decision to serialize the goings-on, maintaining an ongoing plot arc about an enigmatic known only as Mr. E (voiced by Lewis Black), who regularly provided the gang with clues about a strange secret buried in Crystal Cove’s past. 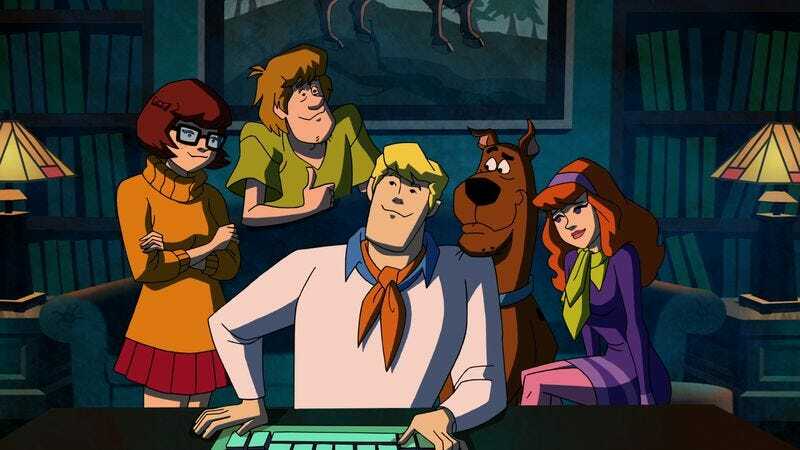 Since then, Mystery Incorporated has followed some of the traditional Scooby-Doo tropes, generally keeping the monster-of-the-week premise intact, but the writers have continued to up the ante on the back story of Scooby and the gang, revealing that—not unlike Alan Moore’s expansion of the Swamp Thing mythos—they are but the latest in an ongoing series of young mystery-solvers working alongside an animal companion. Some of the others have included the Mayan Hunters of Secrets and their jaguar, Spot, the Fraternitas Mysterium and their donkey, Gordo, and the Benevolent Lodge of Mystery and their orangutan, Mr. Peaches, all of whom are primed and ready for their own animated series. The most notable to the series’ plot, however, was the original Mystery Incorporated, who, instead of a dog, had a parrot mascot named Professor Pericles. Funny thing about Professor Pericles, though: he turned out to be evil, although that may have been slightly telegraphed by the fact that he’s voiced by Udo Kier. Well, that and the fact that, when he made his first appearance on the series, he was sporting a scar, a cataract-in one eye, had a ball and chain clamped around his leg, and was wearing a straitjacket. Still, there’s evil, and then there’s this parrot, who’s basically the feathered version of Mr. Mind, if that Shazam! reference isn’t lost on you. Although the aforementioned Mr. E may have seemed to be the series’ big bad when things started, there’s little question that, as this second season—and, quite possibly, the entire series—comes to a close, it’s the Professor who’s the worst of all. Trying to describe the goings-on in “Through the Curtain” and “Come Undone” without the necessary frame of reference is somewhat fruitless, as it would literally require a trip through the entire series to date. Suffice it to say, however, that it would be hard to conceive of any future Scooby-Doo series ever reaching the epic, insane heights of what happens over the course of this hour, let alone its entire two seasons to date. These characters, who were introduced in a series where their chase scenes were choreographed to bubblegum pop and they were regularly pulling rubber masks off of petty criminals with delusions of grandeur, have somehow reached a point where Velma is chattering on about string theory, their adventures have gone trans-dimensional, and, so help me God, the whole thing is brought to a conclusion with the help of Harlan Ellison, who, yes, most certainly does provide his own voice. Mind you, this comes on the heels of a season where it was established that Jonny Quest’s dad built Dynomutt, Martha Quinn turned up as the owner of a record store and tried to sell the gang a third-generation bootleg of Scritti Politti’s Christmas album, Fred and Daphne quoted Kirk and McCoy as the Mystery Machine blew up, and, so help me God, a dancing dwarf voiced by Michael J. Anderson took Scooby and the gang on a trip to Twin Peaks' Black Lodge…or, at the very least, a place that looked a hell of a lot like it. Scooby-Doo! Mystery Incorporated is a series that’s been severely underestimated—and reasonably so—because of how badly the original fans of the franchise had been let down over the years. Now that the first season of the series is available for streaming on Netflix, however, here’s hoping that it will slowly but surely begin to find the following it’s deserved since the beginning. It’s clever, funny, and, yes, unbelievably epic. So epic, in fact, that my wife turned to me while watching the season finale, wide-eyed, and said, “This is pretty heavy stuff for a kid’s show!” But that’s the thing: it’s not a kid’s show. Not this time. This time, it’s aimed at everyone who loved Scooby-Doo when they were kids but felt guilty about watching it once they were grown up…and this time they don’t have a thing to be embarrassed about, because it’s awesome. We can only hope that there’ll be more of it yet to come.